Sketching troglodytes along the Loire. 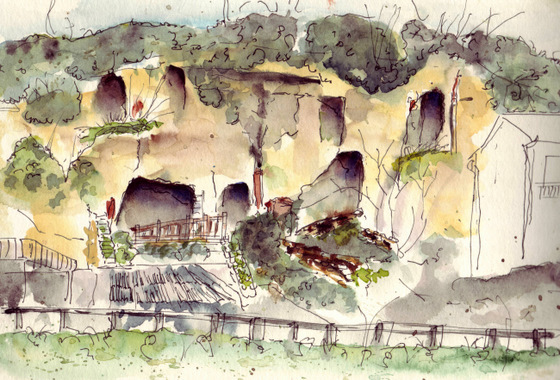 by Myfrenchkitchen.In france, Montlouis sur Loire, Nature, pen, sketchbook, Sketchercise, watercolour.8 Comments on Sketching troglodytes along the Loire. In winter the troglodytes all along the Loire are much more visible than in summer when they hide behind lush green vegetation.They are nestled in the cliffs high and low and some are still inhabited, although it is getting less frequent, as circumstances are changing and cliffs get unstable and dangerous. 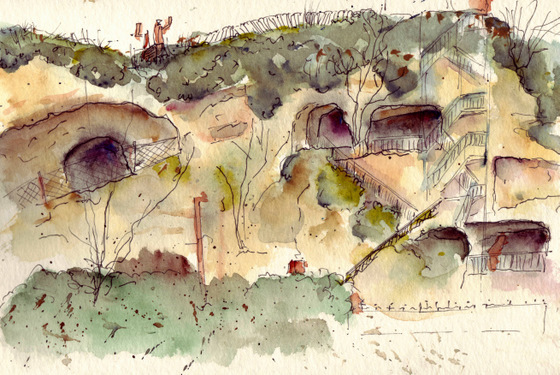 I went down the road this morning and sketched two spots where the caves/troglodytes are still inhabited and a smoke trail is often seen escaping the hidden chimneys. ..sketches done in sketchbook, 14 x19cm, pen and watercolor..
My contribution to Sketchercise, where sketching and exercising combine to keep us healthy and creative at the same time! Oh these are wonders Ronelle..I saw some in France.. but I notice yours have stairways.. ..and I spy people walking atop too..It amazes me that you can walk to this. Has it warmed up? Do you wear fingerless gloves? I remember to have seen some of them. Great work! You have real troglodites? These sketches are great. I love the idea of sketchercise. WONDERFUL, Ronell — both your sketches AND to see your incredible artwork again!!! Hope your holidays were fabulous and the New Year is all you hope it to be! Every troglodyte would love these sketches. I do, too! What a find!!! These are great! I didn’t realize these were hiding there. Your style of sketching is perfect for these. Wishing you and your family a Happy New Year! May it be a peaceful, happy, and productive year. I’m fascinated by those cave dwellings, too! We saw so many in the Dordogne year before last. You have done a great job of capturing their look, their quirkiness and charm. Happy New Year to you and your lovely family! These are wonderful. I love the way the 2nd sketch has an abstract quality. Previous Previous post: Drawing faces in contour.